[By CT] Hey there, On Second Scoop readers. I'm CT from the Nerd Lunch blog and podcast. I live in Tallahassee, Florida and recently discovered a local ice cream company that I thought I'd try for Dubba. I first heard about this in 850 Business Magazine that did a story about the company. Now in the interest of full disclosure, I actually work for the company that produces that magazine, but still... not every article grabs my attention like this one did. "Our ice cream is handcrafted using milk from our farm, local ingredients, and a passion for creating flavors that showcase those ingredients. In addition to the creamery, we own and operate a dairy farm where we provide our cows with special attention and care. In return, they provide us with delicious, high-quality milk for our ice cream. 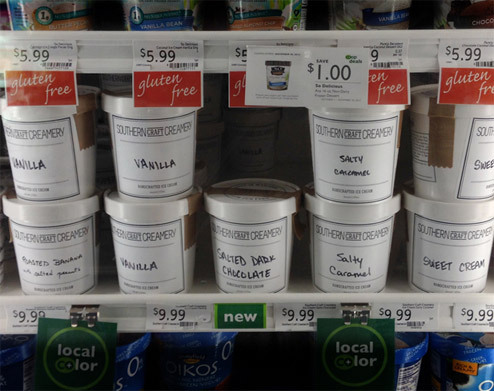 Thank you for sharing our passion for local farms and handcrafted ice cream. Want to learn more? Follow us at facebook.com/SouthernCraftCreamery"
It all sounded pretty interesting. I learned that at least two locally-owned locations in town carried the ice cream. I decided to scope out the situation and visited New Leaf Market. There I saw a selection of pints that all sounded good: vanilla, roasted banana with salted peanuts, salted dark chocolate, salty caramel, and sweet cream. I also saw a $9.99 price sticker. Now, I get it. I understand why it is that much based on everything I've read. But I'm kind of a cheapskate and I was going to have to really mull this over before dropping $10 for a pint of ice cream. Ultimately, I gave in. I had to. I made writing this review a "Nerd To-Do" on the Nerd Lunch Podcast and I couldn't disappoint our six listeners now. But at this price, there was only trying one. So I honed in on the Salty Caramel, checked out and headed home. I have to admit, at this point, I was hoping the ice cream would be disappointing so that I would not be tempted to ever drop $10 on a pint of ice cream again. But you know what, this stuff is well worth $10. I took one bite and I knew this stuff was a winner on all fronts. The texture had a feel of homemade ice cream that would be churned out in the middle of summer with slight hints of ice crystals. It wasn't perfectly smooth like like a Haagen-Dazs or even a Breyers would be, but this made me think of sitting on the back porch building anticipation for ice cream while my grandfather finished cranking the ice cream maker. The caramel flavor was not done as a swirl or pieces but rather mixed into the entire batch. So every bite had a uniform buttery caramel flavor. 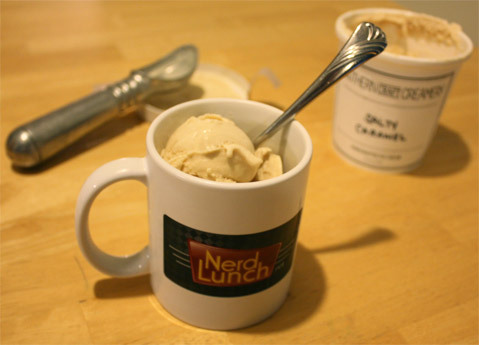 The carton said it was "salty caramel," but the salt was very subtle. Just enough to help keep the ice cream from being too overwhelmingly sweet. After eating it, I felt like I actually had eaten ice cream. Real ice cream. Because it was real. I have to say that I'm super-impressed with this company's business plan right now. They intend to stay very local and very select in where they distribute their product. The design of the cartons and the hand-stamped and hand-written labels add a charm to the product and increase desirability. To be perfectly honest, I'm not going to be able to justify dropping $10 on a pint of ice cream on any sort of regular basis. But on special occasions (birthdays, anniversaries, when guests come to town), I certainly will put this at the top of my list to consume again. And should you find yourself traveling somewhere in the Northwest Florida area, make it a point to track this down. You'll thank me. 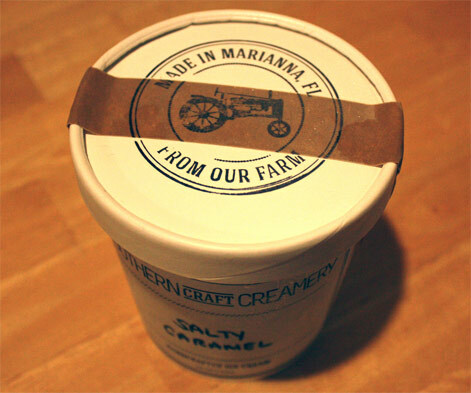 Finally, if the folks at Southern Craft Creamery would like me to review other flavors...look me up. I'm game to try more!